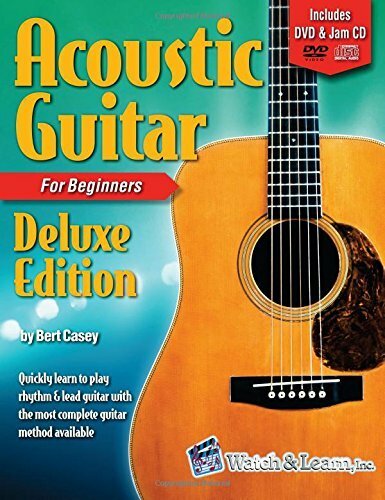 The Acoustic Guitar Primer Book for Beginners Deluxe Edition features step by step instruction, a beginner songbook, a DVD video, and 2 audio jam CDs in one complete package. This step by step lesson was designed to take the beginner through the basics of learning how to play the guitar, including rhythm and lead playing. The student starts off by learning beginning concepts like parts of the guitar, proper playing position, strumming, chords, and how to read guitar tabs. Later you will learn how to play easy songs and then more advanced techniques. The course includes a complete chord chart, an hour of video instruction, and all music is written in both standard music notation and tablature with lyrics and melody lines. The companion audio CDs contain 18 songs played at three speeds each along with an acoustic band, including vocals. These songs include Tom Dooley, Worried Man Blues, Roll In My Sweet Baby's Arms, Dark Hollow, Amazing Grace, Pallet On Your Floor, Way Downtown, Wabash Cannonball, and others. In addition to the DVD and Audio CD, all video lessons and audio tracks are also available for online access. This course is suited for beginners ranging from adults to teenagers.